In 2016, Laws Stained Glass Studios installed (8) opalescent glass windows at First Mt. Olive Baptist Church in Newtown, VA. 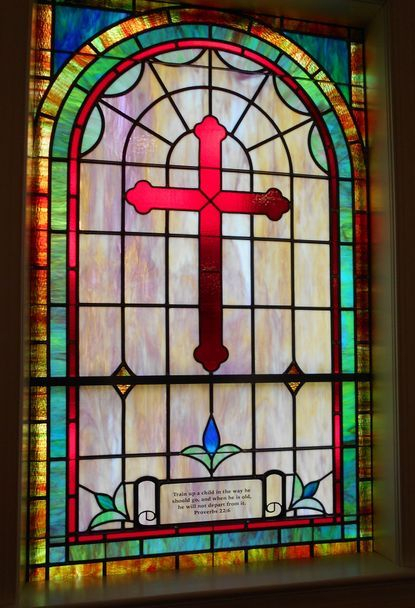 The eight windows (size 40" wide x 66" high) each have a red cross in the center and a memorial plate at the bottom. Laws began the installation by removing the existing wood sashes. The leaded opalescent glass windows were installed into the existing wood frame. On the outside, Laws placed 1/4" Lucite acrylic as the protective covering.